Contemporary Bali style custom home with highly sought after downtown SW sunset views. Large master bedroom with spacious outdoor patio. New outdoor kitchen and large outdoor dining table. This home built for entertaining grand living room space and with four spacious outdoor entertaining areas. Pie shape lot with over 100 feet of waterfront. Infinity pool with hot tub and pagoda. Jet ski lift and dock. This stunning home to be seen to be appreciated! Beautiful modernized waterfront home with many original features completely restored nestled in Sunset Island II. Oversized point lot pie shaped with approximately 122 feet of waterfront with astonishing open lake views. Walk into this beautiful oasis secluded by the lushly landscaped gardens, this private and gated home features large living areas, large gourmet kitchen, impact windows, natural light, separate in laws quarter, ample driveway, swimming pool and an expansive space for a yacht. The only free standing house on Ocean Drive! 1930 property remastered & rebuilt by Todd Glazer. 10-20 ft ceilings. 11 wide plank floors. 4BR/6BA. Rooftop pool, Brazilian Ipe wood deck, outdoor gas kitchen. Viking, Miele, Subzero, Waterworks fixtures. Full Crestron System/Sonos. Cabana style theatre. Custom wine room. Across the street from ocean, walking distance to finest restaurants. New owner receives Full Time Concierge that handles Cleaning, Car Washing, Groceries, Flowers, Event Management (1 yr). WATERFRONT LIVING PERFECT FOR FAMILIES & ENTERTAINING! 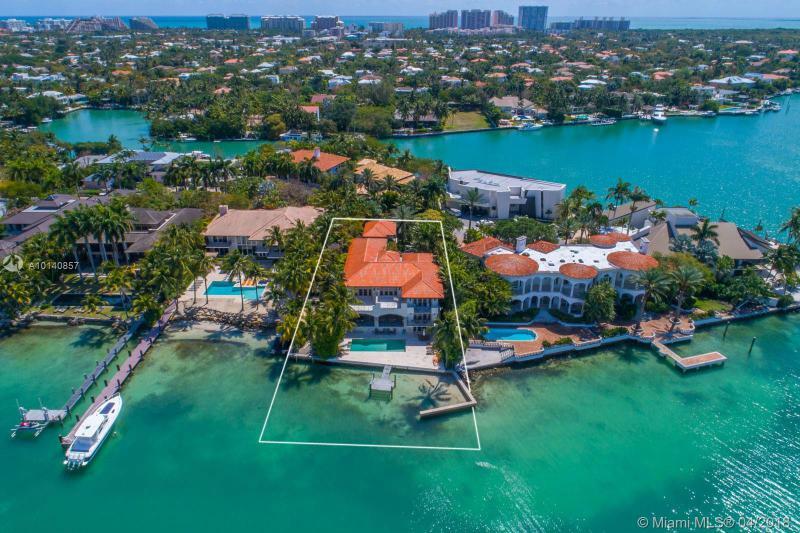 Large Lot with Stunning 2 Story 8 bed/11 bath Mediterranean Residence on Hibiscus Island with 90 ft of water frontage commanding beautiful unrestricted Miami Beach & Downtown Views. Movie theater, Po ol, Beautiful Office over looking the sunsets. Secure Miami Beach Police guard gated community, close to S. Beach, Downtown, Midtown & Beaches. Neighborhood Park and Tennis Courts. No fixed bridges to Bay straight to the Ocean. Warm & Modern Bayfront home. Completed in 2015 with uncompromising luxury details. Southern exposure with stunning views of Miami skyline & Biscayne Bay. Sophisticated European design, white oak floors, soaring ceilings, one of a kind rooftop glass-wall pool, expansive terrace with 360 degree views, home theater, fireplace, totally private top floor artist studio/office with amazing views, uniquely lit glass door elevator & much more. Minutes from SOBE, Lincoln Rd, Arts & Entertainment + Design District.